How many members may I select to nominate? 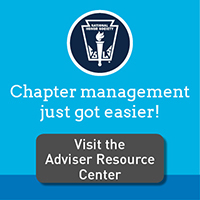 Chapter advisers may nominate as many members in good standing as they wish. There is no limit on nominations. However, past recipients of the award are not eligible to be nominated. How do I select a member to nominate for an NJHS Outstanding Achievement Award? Any NJHS member in good standing can be nominated for this award. With regard to financial need as a consideration, does my school have to participate in the National School Lunch Program in order to determine eligibility of need? No. Your school does not have to participate in the National School Lunch Program in order to nominate students. You can indicate financial need based on a student’s eligibility to participate in the National School Lunch Program by reviewing the income guidelines offered here. They must meet the income eligibility requirements if you indicate eligibility for participation in the National School Lunch Program on the nomination form. Any NJHS member in good standing can be nominated. The inclusion of need is not exclusionary and the response regarding eligibility on the nomination form is optional; if a student does not demonstrate financial need, he/she can still be nominated. It is important to note that award selection is based on the five pillars of NJHS—scholarship, leadership, service, citizenship, and character—and financial need is also a consideration. When are NJHS Outstanding Achievement Award recipients announced? Recipients of this year’s awards will be announced in the spring. Nominees’ parents/guardians will be notified by letter and an email. Principals of recipients will be notified by letter, and NJHS advisers of recipients will receive an email. Who can I contact at the national office with general questions about the award program? Questions may be posed to Elancia Felder, program manager, at scholarship@nhs.us or feldere@nassp.org. During the application process, technical questions about the online application process should be referred to ISTS at NJHS@applyISTS.com or 877-960-3439. Does my principal have to be a member of NASSP in order for my school to participate in the NJHS Outstanding Achievement Award Program? No, but your school must have an active NJHS chapter. Will recipients receive a cash payment? No. Recipients will have a college savings plan in the amount of $500 established in their name by OppenheimerFunds (OFI Private Investments) as part of the New Mexico Education Trust Board’s 529 college savings plan — The Education Plan. No. This is a one-time award. How can students apply for this award? Students cannot apply for this award. NJHS members must be nominated by their current NJHS adviser. Must recipients of the NJHS Outstanding Achievement Award be U.S. citizens? The 529 College Savings Plan Account Owner must be a U.S. citizen or resident alien at least 18 years of age, a state or local government, a tax-exempt organization described in Section 501(c)(3) of the Code, a custodian under a UGMA/UTMA, or another type of legal entity, such as a trust or a corporation, with a valid Social Security Number or Taxpayer Identification Number and United States address. Please note that the 529 Account will be made in the name of the parent/guardian with the student named as the beneficiary. Our school is based overseas. Can students from our school be nominated? Yes! All affiliated chapters may nominate NJHS members for the awards. Please note, however, the requirements for recipients of the NJHS Outstanding Achievement Award: The 529 College Savings Plan Account Owner must be a U.S. citizen or resident alien at least 18 years of age, a state or local government, a tax-exempt organization described in Section 501(c)(3) of the Code, a custodian under a UGMA/UTMA, or another type of legal entity, such as a trust or a corporation, with a valid Social Security Number or Taxpayer Identification Number and United States address. Please note that the 529 Account will be made in the name of the parent/guardian with the student named as the beneficiary. Only recipients, their principals, and advisers are notified. Nonrecipients are not notified.